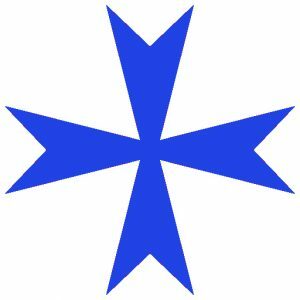 Flags for our Holy Work — #Lepanto @MilitarisCath – Ordo Militaris, Inc.
is our copyrighted historical reproduction of the original Ensign which flew on the Flag Ship of the Supreme Commander of the Holy League, Don Juan of Austria, at the Battle of Lepanto, October 7, 1571 A.D. 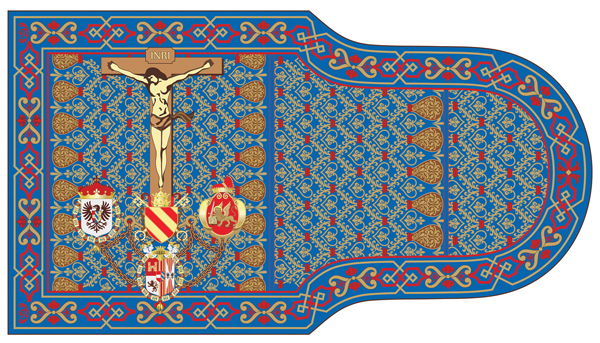 This reproduction shows the Battle Flag of Lepanto designed by Pope Saint Pius V: with a Crucifix supported by the Shields of the members of the Holy League of 1571: King Philip of Spain, Saint Pius V, the Republic of Venice, and Don Juan of Austria, all united by the Chain of the Rosary. The Pattern symbolizes the Fleets of the Holy League in formation, and the woven border recalls the power of the Chain of the Most Holy Rosary of the Blessed Virgin Mary protecting all the ships and sailors. 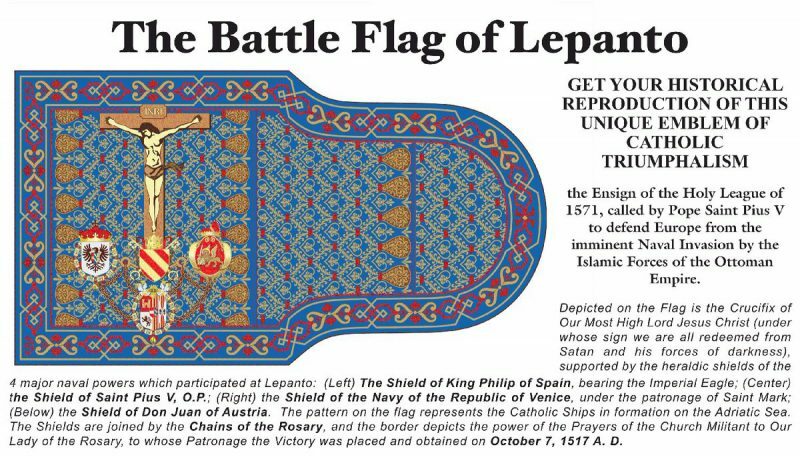 Historical Reproduction of the Battle Flag of Lepanto is single-ply and light enough to be carried by one person on a standard pole. 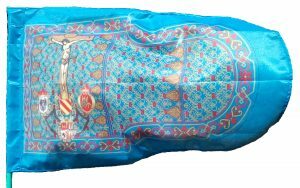 It has a pole sleeve for mounting and is designed on durable cloth fit for processions or for mounting outside in the weather. This flag is NOW on sale for $40 USD, sales tax and shipping included. Press this button to get yours today! It measures 24″ by 41″ inches. Unlike our 2018 version of the Flag, this one is designed to catch the wind and not require apparatus for carrying in a procession other than a tomato-stake like pole (not included). This edition is suitable for small children who are participating in Parades and Processions. TO RECEIVE ONE BY MAIL, make sure to AUTHORIZE PayPal to transfer your SURFACE MAIL ADDRESS, otherwise we will automatically cancel your order and reverse charges. We have only 33 of these flags remaining in stock, so order yours today. If you want this same flag with grommets to be mounted on a boat’s flag pole, indicate that in the note to your Order. The price is the same. But we only have 1 of these left in stock. — If you ordered this flag at the previous price of $100, you are being sent 2 in the mail. 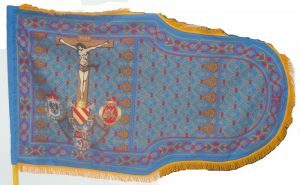 Our Procesion-Quality Versionof the Battle Flag of Lepanto is TRIPLE single-ply and light enough to be carried by one person on a standard pole. This flag is NOW on sale for $250 USD, sales tax and shipping included in the USA. Outside the USA, add 20$ for shipping, and be prepared to pay a customs duty upon reception in your country, IF that applies. It measures 36″ by 65″ inches. And is identical to our 2018 version of the Flag, with yellow fringe on 3 sides. THIS FLAG COMES IN 2 VERSIONS: With a pole sleeve to mount immediately on a standard pole (without a finial), OR with 2 grommets to mount on a standard flag pole, whether to be carried in procession, or fixed in the ground. IN THE NOTE OF YOUR ORDER, please indicate, With Grommets, IF you want yours with grommets. OTHERWISE, you will get a flag with a pole sleeve. The price is the same for each, and each version is available in the USA or for foreign shipment. Our Insignia measures roughly 3′ by 3′, and has grommets to be flown from a flag pole. Its a sewn flag and is identical on front and back, made of heavy nylon, and is an all weather flag. In the USA its available for sale at $100 USD. Please note that for each flag the size and colors may vary slightly from the descriptions above. These Flags are for sale, the price includes all applicable sales tax and shipping.